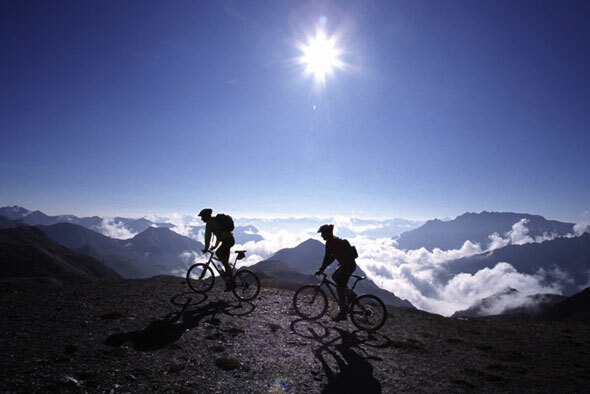 For those with adventure in their veins, the mountain bike can provide the ride to bold excitement. It permits escape from asphalt, traffic and the din of humanity; it facilitates the exploration of back-country terrain, washboard roads and trails. This is a sport whose American roots stem from the hippy culture of the 1960s in Marin County, CA, yet manufacturers paid no mind until the late 1970s when the production of mountain bikes from high-tech lightweight materials began. What was a little-known accommodation of some Northern California wild children now went main stream. When the novice begins to contemplate the sport, it all starts with the bike, of course. The question of rear suspension is one of immediacy; a fully suspended bike makes riding rough country terrain immeasurably kinder to the body as well as aiding traction and control on rough climbs and descents. Many other considerations must be addressed by the beginner when purchasing his first bike including gear carriers, disc brakes, seatposts, chairnrings as well as cycling shoes. But let’s go back to where and what our beginner wants from the sport examining the different styles of mountain biking. Cross country racing produced cross country mountain bikes: or maybe it was the other way around. Here the emphasis is on climbing, speed and endurance which mean that the bikes must be both lightweight and effective. Early in the 1980s and up and until the early 1990s, cross county mountains bikes had lightweight steel hardtail frames with rigid forks. Two definitions must be attended to here: hardtail refers to the bike frame with only front suspension. In other words, there is nothing to soften the ride in the back half of the bike. The second definition maybe redundant but just in case, the fork on a bicycle holds the front wheel in place permitting the rider to accomplish balance as well as steer. During the 90s, cross country bikes developed into lightweight aluminum frames with short front forks, and finally, most recently full suspension designs are available everywhere. This has been done with the use of advanced design carbon fiber composites. Two of the most successful of these bikes is the Specialized Epic and the Merida Ninety Two, both having been used to win the World Cross Country Championships. Remember that these bikes are intended for off-road because of their lightweight construction; they cannot be used on extremely steep or severe terrain. These bikes were developed from the original cross country one and are generally used on off-road trails. There is not the emphasis on weight with trail bikes; therefore, they are normally built to handle rougher terrain. They do not have the taut head angles required of the cross country bike which provides better stability when descending a steep slope. Examples of these bikes include the Specialized Stumpjumper FSR, the Giant Trance and the TREK Fuel EX series. These bikes often use 20 to 26 inch wheels and have small, low frames because their riders like to hop or jump over obstacles and need the utmost balance and concentration. Downhill riding is largely high-speed in nature; therefore, these bikes usually have at least eight inches of travel suspension. Their frames are very strong but remain light which can be more expensive because of the use of additional alloys. Recently, downhill bikes have been manufactured at under 40 lbs. They are usually good for riding dedicated downhill courses because they have high gears and slack angles allowing them good traction over bumpy trails. Conversely, they are not particularly good for any other type of mountain biking for exactly the same reasons. Because of the high speeds achieved in downhill riding, the bikes only have one chain ring in front with a huge gash guard and chain guide; these are additional reasons they are not desirable for the general population of mountain bikers. Freeride bikes are similar to the downhills we have just discussed, but there is more emphasis on strength and less on weight. They are built from stronger, heavier materials. Although they can be ridden uphill, they are not efficient and have a moderate slack which makes them hard to maneuver while angled up a hill or when traveling at low speed. Because frame angles are steeper than their downhill brothers, they are efficacious on most technical downhill trails. They can easily maneuver over and around small interferences incurred by the rider. Usually, the freeride bikes are heavy and have too much suspension to be a comfortable uphill ride; however, recently manufacturers have come up with more expensive models with suspension that makes them easier to ride uphill. For the rider, free riding means finding a perfect line down the mountain, yet using all of the terrain as an expression of the ride. This bike spans the breach between cross-country and freeride bikes with greater suspension travel of as much as six inches. It is designed to climb and descend and can be ridden for long periods. Weight is somewhere between 29 and 35 lbs. These bikes are a combination of BMX which has 20 inch wheels and are used to perform tricks at skate parks and freeride bikes. They are usually very strong with four to six inches front suspension, no rear suspension and very few gears. They normally have very low seatposts and oversize handlebars with an extended rear brake cable and no front brake. This permits the rider to spin the handle bars without interfering with the brakes. All of this so that the rider can jump the bike over large dirt jumps and perform tricks while airborne. The danger increases because the jumps are quite close together allowing the riders to go over six or more jumps in one run generating more speed for large jumps. This is a new style of riding. Four bikers try to get down hill first. The bikes are usually full suspension with no more than three or four inches of travel with very strong frames. There is a chainguide on the front and gears on the back with very slack head angles to assist in cornering and acceleration. Whereas four-cross is a relatively new style of riding, the very newest form of mountain biking is short cross or speed cross. Here, the rider traverses short, narrow forest paths with all manner of impediments such as roots, rocks and streams but no ramps. The paths are no more than 300 feet in length. The idea is to go at extreme speeds with the associated thrills of getting through the hindrances without crashing. The best bicycle for this is lightweight, but with the long travel of a full suspension bike. So, Mr. or Ms. Beginner, here are the current types of mountain biking done on the planet. Each offers its individual challenges; each is done on different playgrounds. There are national forests, state parks, unpaved roads and trails. The first move is the “get started” one. Look for places close to home and start thinking afternoon rides. Next, think overnight rides. Begin with an appropriate bike, most of which we have discussed here at length; get a good map; and don’t forget to bring along that most important of tools, an adventurous spirit. There are many sources of information, some online and some published hard copy. “Dirt Rag” is an independent forum written by mountain bikers; “Mountain Bike Action” provides insightful information about this fast growing sport. Both are hard copy, published in twelve issues. “Mountain Bike Magazine” is probably the best of published hard copy on the subject; it has been published for over eleven years and has retained its original readership as well as added circulation annually. SingleTracks.com provides excellent direction for those interested in online blogging. Another is DirtWorld.com. So, it appears that for those who wish to involve themselves, information abounds as does the call of the trail. Proceed!